Many users comment that the Under Armour Curry 2.5’s upper materials are very durable. The shoe gives a fluid heel-to-toe transition, remarks some of the buyers. The majority of users agree that traction is still as top-notch as the Curry 2’s. Nearly all users of these basketball high-top sneakers commend the burrito wrap construction and asymmetrical lacing since these gave them a secure and very locked feeling throughout their games. Almost all expert reviewers say that although the fit of the Curry 2 was already great, the Curry 2.5 fits even better. A lot of users comment that the cushioning on this shoe is also an improvement, thanks to the thick PU insole. Because of the snug fit of the upper, many say that the shoe feels like an extension of their feet. Since the UA Curry 2.5 uses sturdier materials on its upper than the Curry 2, majority of the buyers find the shoe to provide great ankle support. Most of the users say that the fit gets better with every wear. Because of the burrito wrap construction of the tongue, some users find it hard to put the shoe on. Ventilation-wise, majority of the users complain that the shoe is really hot and builds moisture during use. Many players say that the shoe runs small. The Curry 2.5 is archless; people who need arch support might need to swap the insole with one that has a raised arch area. A lot of users remark that in spite of the added OrthoLite insole, they still prefer to have the Micro-G foam of Under Armour. Although it had its flaws, many expert reviewers thought that the Curry 2 was a great shoe. In fact, it’s only with the release of the 2.5 that many realize that the shoe could still be taken to the next level. The tight fit and sticky traction of the 2.5 is perfect for guards or players whose styles are similar to Steph’s. For $135, these really get the job done. What I can tell you is that both the traction and cushion are the same and still perform at a very high level. UA kept the best parts of the Curry 2 while slightly improving the cushioning, fit and containment. Can’t ask for much more than that. If you like more support of focus a lot on down-to-ground moves then the UA Curry 2.5 will be your shoe. Under Armour retains the good features of Stephen Curry’s second signature model and improves on the not-so-solid aspects of the shoe. With the redesigned upper and asymmetrical lacing system of the Curry 2.5, fit and support are the main drivers of the shoe’s innovation. Stephen Curry’s signature shoes with Under Armour are known to deliver a comfortable and great fit. The 6th low-top Curry basketball shoes are loved by too many reviewers and new buyers because of its exemplary cushioning. The full-length HOVR midsole gives so much satisfaction when it comes to impact absorption. The same cushioning is applied to the high-top HOVR Havoc non-signature Under Armour model. Its responsiveness receives praises from athletes with different playing styles. Cushion. The Curry 2.5 uses the same UA Charged cushioning that was used previously on the Curry 2. However, an OrthoLite insole is included for added comfort and impact protection. Traction. The shoe retains the organic and multidirectional herringbone pattern that performs excellently indoors and outdoors. It requires minimal wiping, making you think more about the game rather than what’s on your feet. Length and Width. The shoe runs small according to many wearers. If planning to purchase, go half to a full size up. New buyers may also visit their local shoe stores to fit the Under Armour Curry 2.5 personally. Lockdown. The Curry 2.5 uses a burrito wrap construction where the tongue is attached to one side of the upper and overlaps with the other end when the laces are tightened; giving the shoe its remarkable fit. The shoe also features an asymmetrical lacing system that pulls the upper in two different directions and pushes the foot into the shoe, ensuring zero slippages. The UA Curry 2.5 uses a full-length mesh with PU rubber overlays and molded synthetic on its upper. The rubber overlays are thicker on high-wear areas of the shoe. The midsole is made of an OrthoLite removable insole and a Charged foam cushioning. The outsole, on the other hand, is made of thick rubber. The midfoot shank and external heel counter are made of TPU. 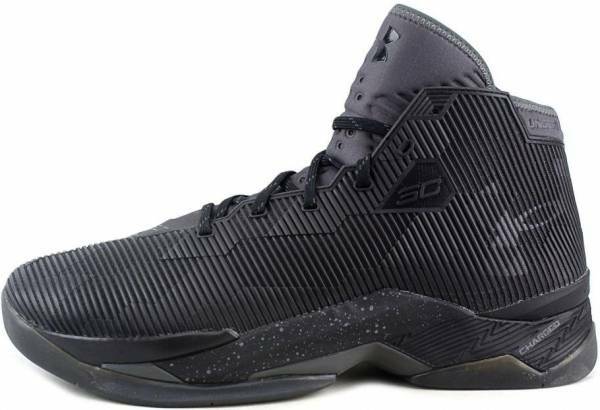 The Under Armour Curry 2.5 has design features that symbolize significant details of Stephen Curry’s career such as the dots on the external heel counter that stand for the Oracle Arena coordinates, the MVP’s home court. Also, the molded lines on the upper take inspiration from the Bay Bridge. The Under Armour logo can be found on the tongue, the lateral side of the heel, the tip of the toe box and the midfoot shank; while SC callouts are on the lateral and medial sides of the shoe. Lastly, the words I CAN DO ALL THINGS is embossed on the medial side of the forefoot.